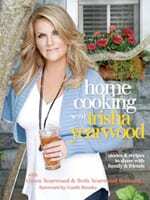 Trisha Yearwood will release Home Cooking, the follow-up to her best-selling 2008 cookbook, Georgia Cooking In An Oklahoma Kitchen, on April 6th from Publisher Clarkson Potter. She again teamed with her mother Gwen Yearwood and sister Beth Yearwood Bernard on the project. Husband Garth Brooks is also featured. Yearwood will appear on an upcoming episode of Paula Deen’s Home Cooking on the Food Network. Watch a video blog from Trisha about the launch of her cookbook below.